Spiritual - Consider the verse above where I always put a quote. It's one that will bring many beautiful and peaceful visions of God's protection to our hearts and minds. It also tells us what to do when we want to "run" from something in our lives. Fear, failure, finance problems, needed healing... God is there for us always, ready to wrap His arms around us. The righteous person puts his security in the name of the Lord. I have this visual image of approaching Jesus for a hug and when He wraps His arms around me and brings me close I dissolve right into His body. My title for the image is "Abiding in Christ." It's knowing who we are in Christ that gives us all the promises of God. 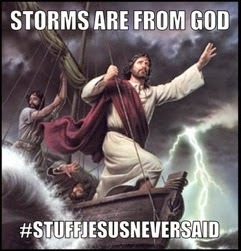 There is such great comfort there. "For no matter how many promises God has made, they are "Yes" in Christ. And so through him the "Amen" is spoken by us to the glory of God" (2 Cor. 1:20). Birds - Last month we had a Female Yellow-shafted Northern Flicker hit our deck door and survive. She continued to hang around and was at the suet feeder many times during the days. A little over a week of seeing her, we finally noticed two males had come into the territory. I thought it odd that she was alone. They usually hang out in groups. I'm glad she's got a couple of suitors for Springtime mating. I'm still believing for an early Spring of beautiful weather days. As you can see those bright yellow feathers, you would know why the bird is designated with the name yellow-shafted. The reason for the variation of names is because there is also a red-shafted species that shows rosy red colors on the feathers. What designates male and female is whether or not they have that splash of a 'moustache' on their face. As you can see in this one, it's a splash of black. 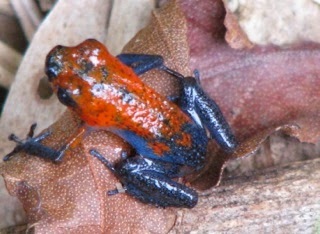 In the Red-shafted species it gets a splash of red. The yellow-shafted is in the East and out to Texas and the Great Plains. The red-shafted resides in the West. Unlike most woodpecker species, Northern Flickers spend a lot of time on the ground and when in trees they often perch horizontal branches instead of leaning their tails against a tree trunk as most woodpeckers do. Their flight pattern is an up-and-down path using heavy flaps interspersed with glides. This is the pattern for most woodpeckers. 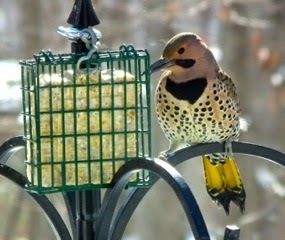 Our feeders were very busy with the frigid cold we had the week after Valentine's Day. 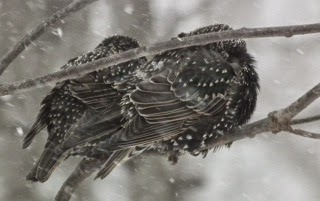 We had 8 inches of snow overnight which had a frenzy of birds out back racing around to suet feeders and seed feeders and cracked corn placed on our concrete benches swept clear of snow. Then a few days later we had 6 inches and again a few days later 5 inches. First snows of the year and much deeper than we usually get which is 1-2 inches. 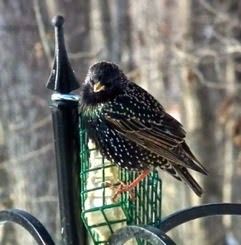 We had a female European Starling arrive on February 17th and then I saw a male the next day. Three more days and there were four. We get flocks of starlings coming through during migration, but it's certainly not time for that. I'm guessing some of the birds that are farther north have headed out in hopes of finding "greener" pastures. On the 26th I saw seven of them. The flock is increasing and the bluebirds are upset since they don't get as much time at the suet feeders. I am in hopes that we've met our limit with seven. Starlings were never designed to be in the USA. God put different species in different parts of the world for good reasons. They are called 'native species' where they are supposed to live and 'invasive species' where they are not supposed to live. The starlings came from Eurasia, introduced in 1890 as part of a plan to introduce to the U.S. all birds mentioned in the works of Shakespeare. They now compete with native species for food supplies and also destroy agricultural crops. (Fofonoff et al. 2003). They were released in Central Park, New York and were dispersed across the continent by the late 1940s. Population currently exceeds 200 million. I'm grateful we only have three. They can be aggressive to other birds. They've been fighting the bluebirds for dominance on the suet feeders. Critters - We have two holly trees at the corners of the bay window of our breakfast area (planted because we thought they were bushes). They require a lot of pruning but provide so much shelter for the birds since they're very near the bird feeders, so I get a lot of literal up-close-and-personal views. It's also an area where I can open the window and toss food below since it's a covered brushy area so the birds aren't wide open to the hawks. 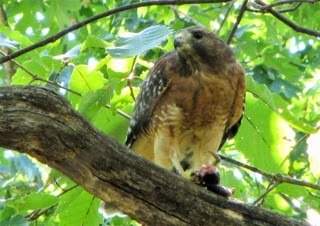 Fortunately I don't get to see hawks feeding ... other than one time a Red-shouldered Hawk took a huge Green Frog from our pond's edge. Took a bunch of pictures and a video of the horrible event and wondered why the whole time I was shooting. Back to the window ... a few days ago I looked out to see who was visiting and besides the usual White-throated Sparrows, Rufous-sided Towhee, and Mourning Doves, there sat a small rabbit licking up the millet. So very cute and precious! Hadn't seen a rabbit for a couple of months. I know they're out and about and surely access our fruit and veggie scrap pile during the night out from our deck. This little one was not fully grown so it sure made me wonder about when that Mama was having babies. We had a visit from Mama LoveDeer and she's still looking so good even with the limp. It's quite amazing how she's been determined to survive. I've noticed a change in attitude from some of the other deer, whereas they used to just chase her away, they cautiously approach now, look a bit and then back off. Go Mama! Gardening - There are invasive plants also. They take away food sources for the bird and animal native species by overtaking the native plants that feed them. Get some native plant gardening ideas from this article Native Plant Gardening. It's about time for pre-emergents to be put down on lawns and areas where you don't want weeds. You spread this stuff before the seeds can open and begin their process of creating more weeds. There's an article in last month's posts that will give you information on this topic: Using Cornmeal to Kill Weeds and Ants. Travel & Dreams - I have friends, Susanna and Mark, that I met through The Nature In Us who had a piece of land in Costa Rica. She and her husband had a dream of retiring there. 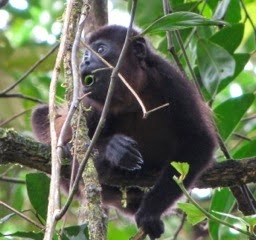 When I was down in Costa Rica January to March in 2008 for a Language School in San Jose, three weeks of Jungle Time and some Honey Time (30th Anniversary Celebration), I fell in love with the country's slow pace, beautiful flowers and orchids, amazing colored birds and cute critters. View Photo Albums of Costa Rica. Actually we had a week's tour in 1999 that we booked and we saw enough of the country at the three locations we visited to be quite taken with it then. Having 56 days there was quite a different feel since I really got to get into the cultural differences and see so much more. I got to meet Susanna and Mark while I was in Costa Rica. They made annual trips to continue planting trees on their property and focus on their dream. It was during one of their trips that coincided with my trip that we met face-to-face. What a sweet time. We seemed to be old friends. We have seen them twice since then here in the U.S. If you look around there aren't many people who are willing to go for their dreams. And there was a lot to "Go For" on this dream. The paperwork and legal stuff that had to be done seemed never-ending. They're going to build a home so that paperwork and time line has been a real challenge also. Leaving friends and family were hard choices, but they persevered. They are now living in Costa Rica and beginning the building project. They left about 8 weeks ago and are in paradise as far as they are concerned. They're living in a rental house on a coffee plantation with banana trees in the back yard. Pura Vida is a characteristic phrase which literally means "pure life." But suggestions that come along with the phrase include, "this is living"! Susanna and Mark think it's really living! Most dreams do take a lot of time, meditation, visualization and definitely a bit of determination, but isn't it wonderful to see folks who are still willing to take the challenge and make it happen. Congratulations, Susanna and Mark! It's March and Spring is literally just around the corner. One more week and we'll be on Daylight Savings Time. Daffodils will be coming up soon to be followed by Hyacinths. We've already had our Hellebores blooming to announce the arrival of good weather approaching. Oh to see leaves and flowers again. How wonderful is God's creation! 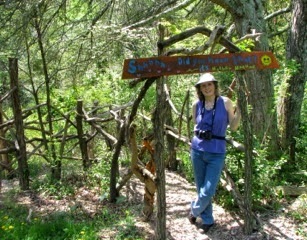 It'll soon be time for nature walks!